I have a confession to make. I like to think of myself as something of a film connoisseur with respectable taste and a decent knowledge of great cinema from all over the globe, but despite that I've always struggled with Italian cinema. Italian food great! A good Italian red wine, fine. Italian football, beautiful! I even had an Italian girlfriend once, but Italian cinema has always left me cold and despite my most earnest efforts the majority of Italian movies that do make it into my DVD player are usually ejected again before they reach the sixty minute mark, even the classics. It is for this reason that L'Avventura had languished, unwatched on my shelf for several years after receiving it as a gift from a similarly cinema obsessed friend who's tried in vain ever since to get me to watch it. I was well aware that it was considered a classic and something of a landmark movie, but had resisted stating my irrational allergy to all films Italian in mitigation, well shame on me! I finally relented this week after some further reading led me to discover that not only was it considered great but had actually spent some considerable time on both Sight and Sound and the BFI's lists of the ten greatest movies of all time and my know it all movie buff pride overcame my Iberian prejudices. 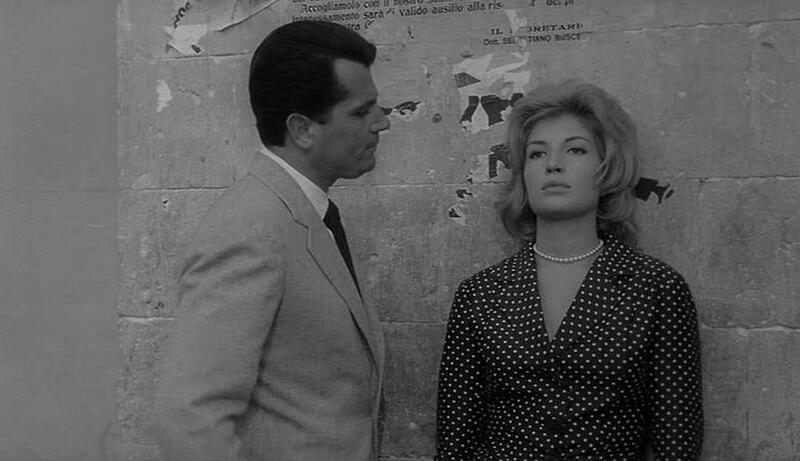 Released in 1960 and directed by Michaelangelo Antonioni L'Avventura premiered at the Cannes film festival where it met with such a chorus of boos that both director and star Monica Vitti fled the theater. Regardless of this it won the special jury prize and went on to be a worldwide box office smash, it's brand of elegant ennui becoming something of an emblem for the super cool sixties. The story, if it can be said to have one, centers around the disappearance of Anna, a beautiful young bored socialite whilst on a boat trip with her equally beautiful bored friends and the resulting search, but that is not really the point here. Antonioni intentionally strays away from traditional cinematic narrative structure using the mystery of Anna's disappearance merely as a framework on which to build a series of character studies of a group of people for whom, despite being rich and free to live as they please are bored vacuous and seemingly emotionless, carrying on love affairs more as a cure for tedium than from any real feeling and as the film progresses the mysterious disappearance is slowly forgotten as the protagonists' seemingly boundless self obsession washes over everything else. As with many classic movies the production of L'Avventura was plagued with difficulties. The production company went bankrupt, the crew went on strike due to non-payment, weather conditions were so bad on the Island where the first part was shot that the entire crew was stranded there for days and Lea Massari, who plays Anna, had a heart attack part way through shooting and was in a coma for two days. Despite all of this what resulted is a compelling and often visually stunning film that deserves all the accolades it has received. The cinematography, especially in the first part of the movie is entrancing, the characters often taking second stage to a landscape as bleak and empty as they are themselves and Antonioni's languid pacing fits perfectly the existentialist nature of his subject. I am sorry now that I left this movie gathering dust for so long. It will be going back near the top of the pile for another viewing in the near future and has led me to think I may have been too hard on our Mediterranean cousins, perhaps it's time to give La Dolce Vita another go.